Late night visit but A FINISH!! 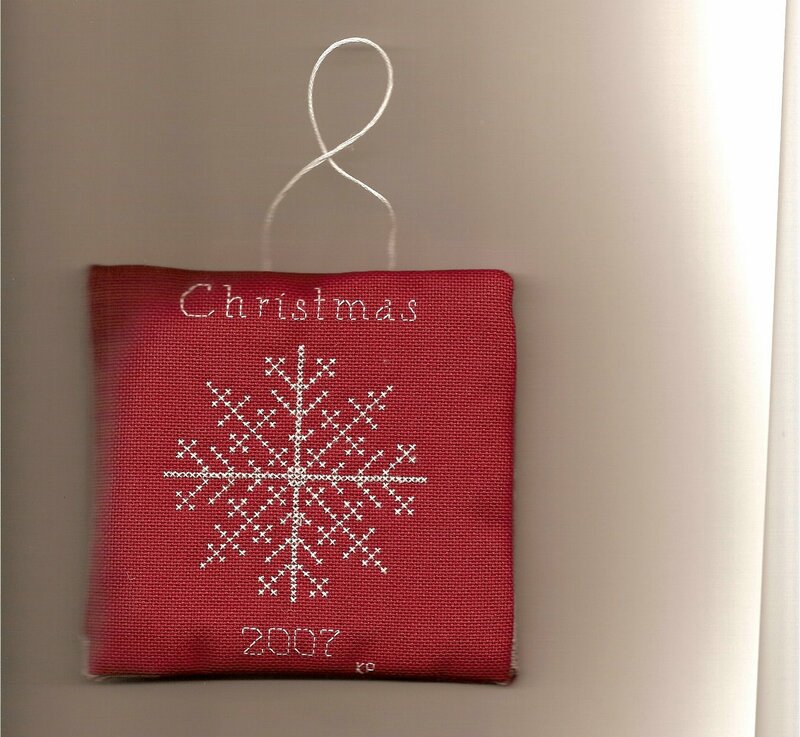 This is a two sided ornament I did for an exchange. I am now off to bed but wanted to post it before I went to sleep. PLEASE, Would you do me the kind favor of sending this to as many people as you can? Christmas will be coming soon and some credit is due to our U.S.service men and women for our being able to celebrate these festivities. Let's try in this small way to pay a tiny bit of what we owe. Make people stop and think of our heroes, living and dead, who sacrificed themselves for us. This week has been difficult for some reason. Lots of headaches but I am calling a new doctor tomorrow and getting an appointment. Hopefully they will be able to get me back on a feeling good road in 2008. 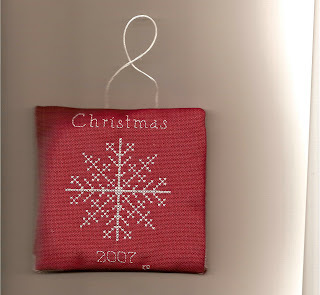 I am looking for a New Year's chart but I can't find one I like much..suggestions? Plus a couple freebie charts. So all and all a good mail day for the day before my birthday...lol! I almost lost my mom this summer. I was no where near ready. She had been living alone and falling alot. She ended up in the hospital and nearly died. She was placed in a nursing home and then assisted living. It was the HARDEST decision my family had to make. 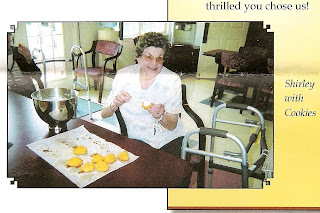 This is a picture of mom from the assisted living November newsletter. She looks like a new woman and I don't know the last time I saw her making cookies. My sister was kind enough to send me this picture and it made my day. I am still hundreds of miles away from her but sleep so much better know she is doing well. I had a trip to the stitch shop as well today to pick up things for exchanges and my snowman thing(winged wordling)which also made me happy. A client told me tonight that I really made a difference in her life and she has taken positive steps to improve things. All in all, I am very happy tonight and pleased that I now get to go stitch! So this weekend went fast. I really miss Frank and we are only halfway from last visit to Thanksgiving. What am I going to do when he goes to Afghanistan? On that note, he is going to try and request to leave in March so he will be back in the fall for the holidays. So today I got some work done, cleaned, did laundry, etc etc and now at whatever time it is I am still up. I started his Christmas present tonight but of course I can't say anything..he may be reading...lol! So far it looks cool. The best news is tomorrow evening I get to go stitching and Matthew asked me today when Nov. 5 was. When I answered tomorrow, he replied "Great I get to go back to that lady's house!" So hopefully it will go well. Keep your fingers and anything else crossed..lol! This week will be busy with work. On Monday, 2 clients; on Tuesday, nurse meeting; Wednesday, 3 clients; Thursday, 3 clients and Friday only 1 client but I am doing a ride along and M is off school. Friday night will be kids night out at gymnastics and I will need it by then..lol! Frank may be home next weekend but I doubt it. It is Veterans Day so he may have a long weekend. At this point though he doesn't have a plane ticket and getting one this close would be expensive. But to do the 7 hour drive for a few days isn't worth it either. Well I am off to read for a while and then to sleep..oh watch Desperate Housewives I taped earlier as well. 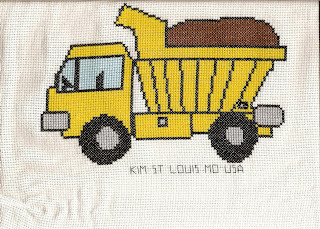 I finished the dump truck tonight. It will fly off to Australia tomorrow if I can get to the post office. If not, Monday. I didn't do too bad as I wanted to finish it by 11/1 and on 11/3 about 1am it was done. I hope the little guy I made it for likes it. 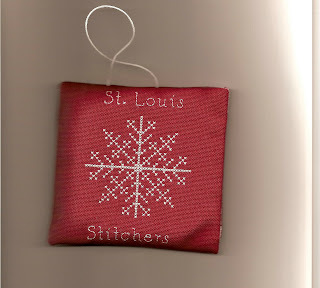 Now on to stitch something else....but which one waiting in the wings? I am SUCH an puter idiot! We have 2 printers and last night I was cussing at the one. 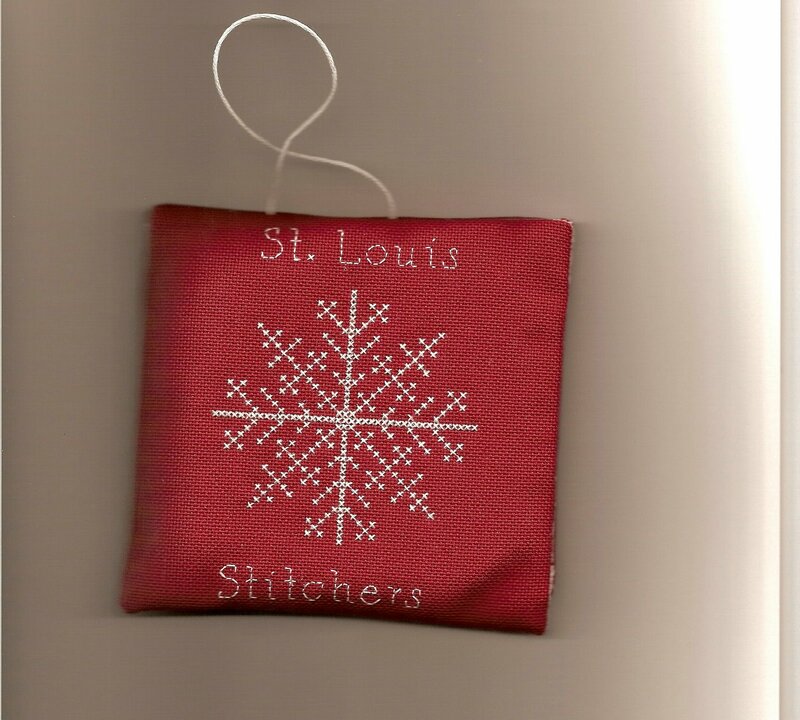 It all started cause I wanted to print The Gift of Stitching magazine in color. One printer is laser and black and white, the other is a regular printer and will print in color. I tried for hours to get that thing to print without success. Finally I basicly threw everything off my desk, turned the printer around and plugged it into a different place. Amazing it worked. So then I went to bed. I did work on my dump truck some. Did not sleep much cause Matthew was coughing. This am, he was exhausted and not feeling well. I kept him home and took him to the doctor. He has a sinus infection. At least he is now on amox and will get better. He is also very crabby! We then stopped by my work cause I had agreed to do a special project over the weekend to earn extra money. I can do it here at home while watching tv..lol! Now we are home and I am stuffy with a headache. Hope M is not sharing his bugs with me. Plans for tonight are very low key...plan to (hopefully)finish the dump truck and relaxing. I will post a pic when it is finished.